Magno Rubio is small; both the man and the play titled “The Romance of Magno Rubio.” As the cast yells out in unison at the start of the show, “Magno Rubio, four feet six inches tall. Magno Rubio, dark as a coconut ball/With a head small/And limbs like a turtle.” The belittling words set the stage for the conflict ahead. Magno Rubio (Jon Jon Briones) is a tiny man in love with a large woman and a huge dream, for which his fellow Manongs – Filipino migrant workers – constantly tease him. 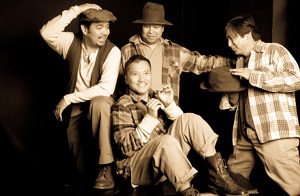 Audience members at [Inside] the Ford in Hollywood not familiar with how Manongs were treated in 1930s California get the picture as they take their seats and the words ‘No Dogs and Filipinos Allowed’ graffitied on a wall stare them down. Despite the show’s sparse set and small space, “The Romance of Magno Rubio” packs a big punch; the impact of which is most glaringly felt when the labor camp’s overseer shoves to the ground a Manong named Atoy (Eymard Cabling), who had paused picking fruit because of the rain. He hits him with a switch and commands him to get back to work. It resembles the way black slaves were beaten on plantations, and it highlights America’s recurring, cruel reality of exploiting minorities through an economic system that survives on cheap labor and inhumane treatment of workers. This is a familiar story, this go-round from a perspective that is not heard much, if at all, and especially not in Tagalog, a language native to the Philippines. Director Bernardo Bernardo has adapted Carlos Bulosan’s short story into two languages: English and the Tagalog version, “Ang Romansa ni Magno Rubio,” which runs twice on Saturdays. The show’s message is clear, and rears its heads in spoken words like, “The American dream loves someone else” and “United Snakes of America.” Magno’s dream is personified by a “girl twice his size sideward and upward.” He picks her out in a magazine’s Lonely Hearts section and maintains his faith that their affection is mutual. Clarabelle (Elizabeth Rainey) lives in Arkansas, and the two lovebirds correspond regularly by letter with the help of his friend Nick (Giovanni Ortega), whom Magno pays for his script services. Magno works nonstop and naively sends every penny he earns to Clarabelle. Her response is always the same: It is not enough. Send more. Work harder. Leave nothing for yourself. Missing the point completely, Magno clings to the idea of her love and their impending marriage. “The Romance of Magno Rubio” is a commentary on exploitation, disillusionment and dashed hope that today speaks to just about everybody. For Magno, receiving Clarabelle’s imagined love is equivalent to achieving acceptance and success – what his new homeland promised upon his arrival. His faith in the unseen is what sustains him, what sets him apart from the others, allows him to maintain cheer in the face of hardship. What also supports Magno and his forlorn migrant crew is spirited song and dance. As did many black slaves, the Manongs fill their days and nights with rhythms ­– traditional Filipino love songs called Kundiman – and movement – eskrima, or martial arts using rattan sticks. Again, words are central; most of the dialogue is delivered in rhyme, a clever choice that sometimes adds silly phrases to this serious show, with good result.